Applications are now open for high-standard, dedicated trad musicians to join the Music Generation Laois Trad Orchestra . How to apply: Spaces are allocated on an audition basis – send an email to musicgenerationlaois@laoiscoco.ie with your name, date of birth, instrument(s), standard (how many years you have been playing, any significant performances or achievements in this time), Parent/Guardian contact telephone number (for those under 18) and home address. Note, as this is an advanced ensemble, expression of interest emails are to come from applicants, applications made by parents/guardians on behalf of musicians will not be accepted. The Music Generation Laois Trad Orchestra was established in January 2016 under the directorship of Paul Finn and Siobhan Buckley. 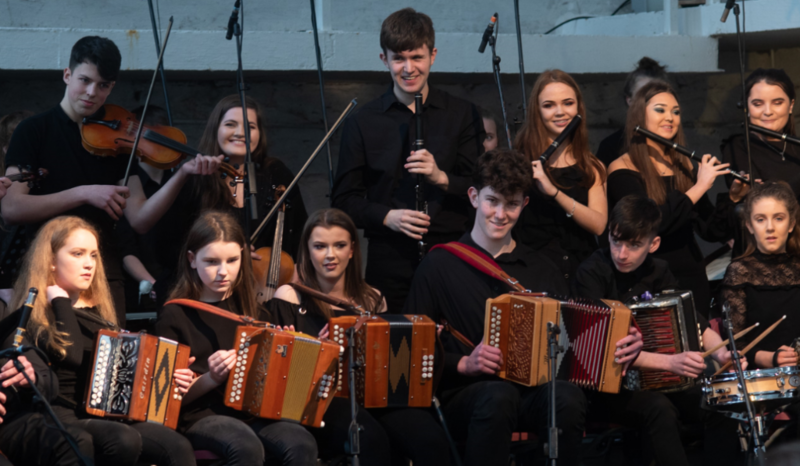 In May 2016, the orchestra collaborated with Donegal Accordionist Martin Tourish to create a new 30 minute suite of music ‘1916 Visions and Voices’ funded by the Laois 2016 Community Fund, Per Cent for Art through Laois County Council and the Music Generation Arts Council Partnership. The music was premiered on the 22 of May 2016, as part of the Music Generation Laois New Works Series, to unprecedented public response! The work has since been performed in Fleadh Cheoil na hEireann in Ennis 2016, for Canadian Prime Minister Justin Trudeau and Taoiseach Leo Varadkar in Dublin Castle and in Powerscourt for the Ireland Funds Worldwide Conference attended by Taoiseach Leo Varadkar and Prince Albert of Monaco and has also been recorded an launched as a CD. In 2018, the Trad Orchestra premiered a new work ‘Loinnir Laoise,’ commissioned by Music Generation Laois and composed by Ryan Molloy as part of Music at the Malt House 2018. This suite of music was performed for a second time on the gig rig at Fleadh Cheoil na hEireann 2018 in Drogheda. Please note: This is a highly professional ensemble, repeated absenteeism is not acceptable nor is poor timekeeping. Frequently additional rehearsals and performances are added and these are mandatory. Musicians must come prepared to rehearsals. Poor conduct and irresponsible behaviour is not permitted.